Endless rain falling these days as I sit at my desk working on this newsletter; I'm so glad that I don't have to leave the house every morning to trudge to the station with an umbrella! A bit of light breakfast ... a sip of coffee while browsing over the morning newspaper ... and then a 'commute' of three or four steps into the workroom ready to get going. At least that's what happens most days - but for ten days this June that routine was disrupted; I made a trip over to North America on a double mission, to spend some time visiting my parents, and to spend a few days attending a meeting of [Baren] - the internet woodblock printmaker's group that I founded some years back. You'll find a report on that 'Summit' meeting inside this issue, along with the usual Halifax to Hamura, Collectors' Profile, and Sadako's Corner. We'll also have an Exhibition Report ... eh? At this time of year? 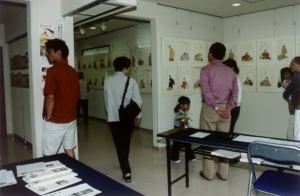 Yes, there was a small, but very interesting and successful, 'extra' exhibition this year over in Saitama. Welcome to the new collectors I met there! So yes ... 'and baby makes three' ... the doctor had confirmed it; 'we' were pregnant! Because the mother-to-be was not quite so young, and as this was to be her first child, amniocentesis testing was recommended; one side benefit of this is that the child's gender is uncovered, and we learned that the baby would be a girl. This knowledge was a kind of 'bonus' to the pleasures and excitement of the pregnancy - we were able to choose a name for the 'child inside', and even imagined that we could feel what kind of personality was developing. But how to choose a suitable name for a 'culturally mixed' child? How were we to know which of the two cultures she would live in as an adult? Should we give her a Japanese name or a western name? The obvious solution, of course, was to give her both; her mother chose the western name 'Anne' (Japanese readers will probably be able to guess the inspiration for that name! ), while I chose the Japanese-sounding name 'Himi'. Actually, 'chose' is not the correct word, because rather than select a name from among those in common use, I created one from scratch. That can be a bit of a dangerous thing to do, as a child growing up with a strange 'label' instead of a name can encounter many problems along the way, but this is not such a problem in Japanese; as long as the name is euphonous, and doesn't carry any unpleasant resonances, it will be accepted readily. As part of the preparation for the birth the two of us attended pre-natal classes, but as it turned out, not much of what we practiced there was to be of much use - the birth was not easy; it took two days, and ended in an emergency caesarean operation. I 'shared' the entire two days with her, including the operation, and although women who read this will probably scoff, I have to say that it was the most intense and draining experience of my life. The two of them were both immediately whisked away into intensive care wards, Himi for intravenous feeding, and her mother for blood transfusions to replace what she had lost during the rapid operation. After this dramatic episode, our lives settled down to a comfortable routine. Of course, the newest member of the family demanded lots of attention - she was one of those babies who cry incessantly for the first few months of life, and she sometimes wore us both down to a frazzle - but we continued along pretty much as before, Himi's mother with her language studies, and me off to the music store every morning and working on woodblock prints in the evenings. I made three or four prints per year during this period, sometimes copies of old Japanese designs, sometimes 'originals'. I printed only a very few copies of each one, just to see how it had 'turned out', before moving on to the next one. 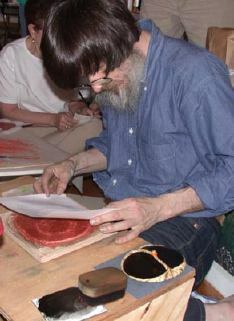 I certainly didn't consider myself a printmaker, just somebody experimenting with the form. As I have mentioned before, autumn was the busy season in the school music business, but once that rush was over, the schedule loosened up a bit. I talked with Bill about getting some time off, and that winter I arranged for another three month break. Himi-chan was now seven months old, and there were two sets of grandparents eager to meet her, one in Japan and one in England. The route was thus decided: Canada to Asia ... then around to Europe ... then around again to Canada. A three-month round-the-world trip with a seven-month-old baby on my back? Sure, let's go! One day some months ago I phoned up Mr. and Mrs. Shoji Hiroe - who live not too far from where I used to live in Hamura - to see if they would agree to be featured in this column, but Mrs. Hiroe told me that it wasn't possible at present, because her husband was away from Tokyo at work. Now I have met plenty of families in which the breadwinner has been posted 'out of town' for extended periods, but I was a bit confused - I had thought that Mr. Hiroe was retired. In this case though, the 'posting' had come about because Mr. Hiroe was retired - he had volunteered to work with an international development agency, and had been assigned to a position overseas. So we arranged that I should call again later in the year when he was back in Japan, and one day early this summer, Sadako and I spent an afternoon with the two of them, hearing about this adventure. Of course we heard many interesting stories, far more than I can relate in this small column. Perhaps Mr. Hiroe should think about starting his own newsletter to let people know what it is like working as an overseas volunteer! The motivation for him to get involved with volunteer work is understandable - Mr. Hiroe is still youthful and energetic, and the thought of just pottering around the house for decades is obviously not very appealing to him. The idea of using his skills and experience in a place where his work could make a difference to people's lives, was just too much to resist. His family offered no objection, so he applied to JICA (Japan International Cooperation Agency). 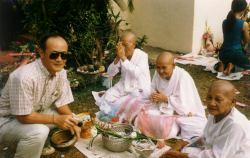 After going through the acceptance procedures, Mr. Hiroe had waited for an assignment, but when it came - to work in Laos in south-east Asia - he wasn't quite sure what to do, as he knew almost nothing about that country. After a quick 'brush-up' session with an atlas and an encyclopedia though, he decided to accept the position, and it seems that the experience has been very fulfilling. After many years of upheaval, the social structure in Laos has become stable, and it is now a country 'on the mend'. With no constant threat of war hanging overhead, as is the case with many developing regions around the world, the work being done by international agencies is in no fear of being wasted. Mr. Hiroe works in a major hospital, using his organization skills and his knowledge of English to act as a coordinator between foreign medical staff and doctors at the University of Laos, a job that seems like very useful work indeed. While all this has been going on, Mrs. Hiroe has been keeping 'house and home' together at this end, and is herself active with volunteer work in her own community. But what she mostly wanted to tell us about were her own visits to Laos! Hearing about that country in her husband's emails wasn't enough for her, so she has gone down there a few times herself, camera in hand. One set of photos she showed us was particularly interesting - one of her husband's local acquaintances was getting married, and Hiroe-san was invited to the ceremony, where she became 'tied' with a thread that guarantees she will return to Laos again! She also became quite interested in the local textiles, and showed us some which she had brought back with her - quite distinctive and unlike any I have ever seen before. 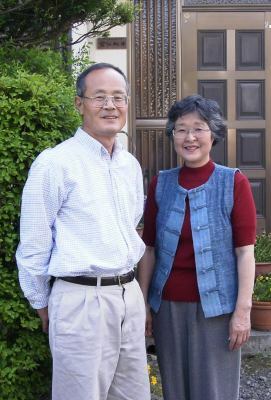 It seems that this couple has really developed quite an affection for the country which they were almost randomly thrown into contact with; as a result of their work and the friendships they have developed there, perhaps in future, mention of the name 'Laos' in their home community won't automatically be sending people to an atlas for reference! I myself am not in the kind of job from which one can 'retire' and then look for useful and productive things to do, so I guess I probably won't be following Mr. and Mrs. Hiroe's example one day, but I certainly do feel admiration for what they have chosen to do. I hope the rewards of their work have made up for their long separations! And I wonder ... does he sometimes think about my prints building up at home waiting for him? Maybe not ... too busy with important work! It has been a couple of years since I last mentioned the [Baren] group in this newsletter. [Baren] is the name I gave to an internet discussion forum that I set up in late 1997. Over the years it grew steadily - it now includes hundreds of members - and eventually reached a stage where I could no longer manage all its affairs myself; I 'gave' it to the members, and asked them to take over the planning and guidance of group activities. Since that time, the group has expanded far beyond the original idea of simply talking about woodblock printmaking, and has sponsored many print exchanges among members and held exhibitions in many places. 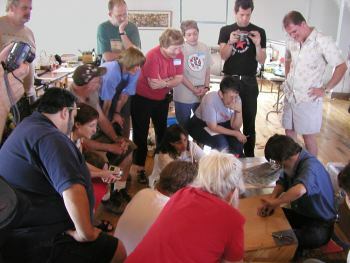 Occasionally members who live near to each other have had small meetings, but the global reach of the group has made larger gatherings difficult to arrange. But this summer, the first major 'Summit' meeting of [Baren] members took place in Kansas City, USA. Of course, because of the location, most of the attendees were from North America, but there was a sprinkling of overseas people in attendance, including a couple from Europe and myself from Japan. "Participants are expected to be generally self-motivated; the [Baren] Summit is intended to be a 'framework' for exchange of information. The physical environment will consist of a large open workroom with some tables and chairs ready for work to begin. 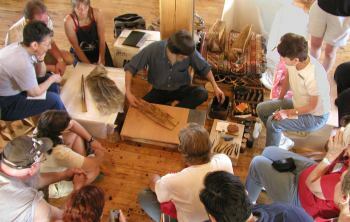 Participants should bring their own tools, supplies, and planned projects. There will be no 'instructors' and no 'students'; the emphasis will be on sharing and learning from each other, without regard to ability." And that's exactly what happened during the week; everybody was constantly busy cutting or printing something, and most people seemed to have chosen work that focussed on a specific area that they wanted to improve. And with 30+ printmakers in the room, there was never any shortage of advice on offer! And there is one story I can't miss telling you! I had been to Kansas City a couple of times before; back when I worked in the school music business, we visited an old, established music company in this city, to learn about their organization and sales methods. More than 25 years have passed since then, so you can imagine how astonished I was to find out that the old brick building where our Summit was being held was ... yes, it was the same building, purchased some years back by [Baren] member Mike Lyon, to serve as his woodblock printmaking studio. Of all the buildings in all the cities of the USA, after all the divergent routes from Canada to Japan ... to end up in the same building ... Now do you think this Summit was pre-ordained, or what! Mrs. Fusae Suzuki, who lives in Higashi Matsuyama City in central Saitama, is one of those enthusiastic supporters of my work who has managed to find space on her bookshelves for every print set that I have ever issued. Ever since the Hyakunin Isshu series was completed four years ago, she has been thinking about ways to introduce it to people in her community, and earlier this year when one of her acquaintances opened a new gallery space, she jumped at the chance to reserve it for a couple of weeks. I couldn't believe she could find time to organize and run an exhibition with all this activity going on, but when she approached me with the idea, I assented immediately (although of course I don't feel that owners of my prints need my permission to display them!). 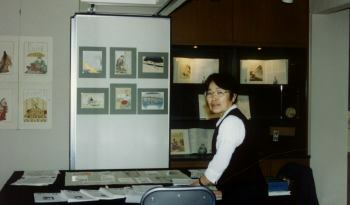 I sent her a box of display materials and announcement cards, and Suzuki-san, assisted by many friends she gathered for the task, designed and set up a very attractive exhibition of all my prints - something I wouldn't have thought possible in the relatively small space available. She then sat there all day, every day, for the nearly three weeks that the show was running, eagerly explaining things to the attendees. And, although the exhibition wasn't set up with the specific intention of selling the prints, her explanations were so enthusiastic that more people asked to become collectors of my new work than at my own large Shinjuku exhibition in January! I attended for the final weekend, and as I watched her talk with the attendees, could clearly see why things had gone so successfully - Suzuki-san, with her multiple enthusiasms and accomplishments, has obviously earned the respect of a great many people in her community. Suzuki-san, thank you for finding value in my work, and for helping me bring it to the attention of so many people. Please be careful when zooming around such long distances on your scooter - I got nervous when you told me about your trip all the way up to Hakuba in Nagano Prefecture, to do some mountain climbing, but happy that you're taking time out to smell those alpine flowers up there! Enjoying nice conversation is the best way to spend time with someone, I think. Stories told by our elders - who have longer life experience than us - are very meaningful, and hearing them brings rich and deep feelings. When speaking with somebody of our own generation though, because we grew up with the same social background, we can feel more at home. Even meeting somebody for the first time, if he or she is a baby boomer, then we are like branches on the same gigantic tree, I can be relaxed. The other day I had a chance to talk with Himi-chan - Dave's oldest daughter - while she was here visiting her father. She has just reached her 20's and is full of freshness. She is luxuriously spending her treasure named youth and it seems she can see only a wide and rosy 'future' spread out in front of her. Himi-chan is now ready to start her career and become a full member of society, and was talking with her father about her upcoming plans. At one point the conversation strayed a little and she gave a strong opinion "Dad, women should be beautiful and must make every effort to maintain their beauty!" Her father tried to interject a clumsy comment about 'inner beauty', but she instantly objected to this; in her mind, physical beauty comes first, and such things are of only secondary importance. This cynical lady couldn't resist interjecting, "What would you do if you got old and wrinkled?" The smile in this innocent girl's face disappeared for a moment, but a cheerful reply soon came back, "I would die!" That evening in my bed I thought back to when I too was in my 20's. Wearing a skirt as short as it could be, I was full of ambition, and could not conceive that I could ever become as old as my mother. 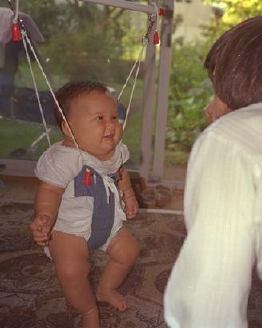 But here I am, now far older than my mother's age at that time! I have gone through a few ordeals and am still alive, proudly showing off my wrinkles and ever-increasing white hairs. It is not so painful living past 50! I wonder what Himi-chan will be like after more decades have passed. What kind of conversation will she have with a girl 30+ years younger? Another pleasure for when I live longer! Collectors who have seen the slow pace of my print production this year may be wondering - what will happen next January; surely David won't be able to get ten prints finished in time for an exhibition, will he? Well, as gallery booking schedules don't allow of any hesitation, I can't easily adjust the dates to accommodate my variable production rate, so the next exhibition will be held in January as usual. 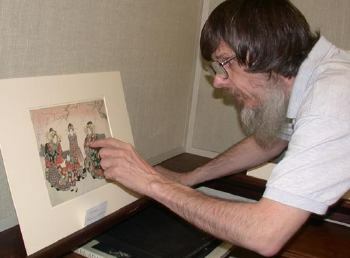 Just how many prints will be on display remains to be seen! And of course there will be a Gallery Talk too - that will be a regular feature from now on!